I noted duplicity by the Obama administration today at "White House Mischief" when it inadvertently ascribed Jerusalem to Israel (when official policy holds Jerusalem to belong to no state). This weblog entry pursues further inconsistencies on this topic. For starters, a check of search engines for "Jerusalem, Israel" on U.S. government websites finds tens of thousands of references. For Google's results, click here. The Zionist Organization of America compiled a listing of U.S. government mentions of "Jerusalem, Israel," in an amicus brief to the Supreme Court dated Aug. 5, 2011. Nov. 14, 2012 update: Amusingly, the Department of State cannot stay away from the "Jerusalem, Israel" phrasing – cannot spell it right. Here is an announcement its security bureau posted today in response to the hostilities between Hamas and Israel: "Emergency Message for U.S. Citizens: Jerusalem (Isreal), Restrictions on Non-Official Travel to West Bank." 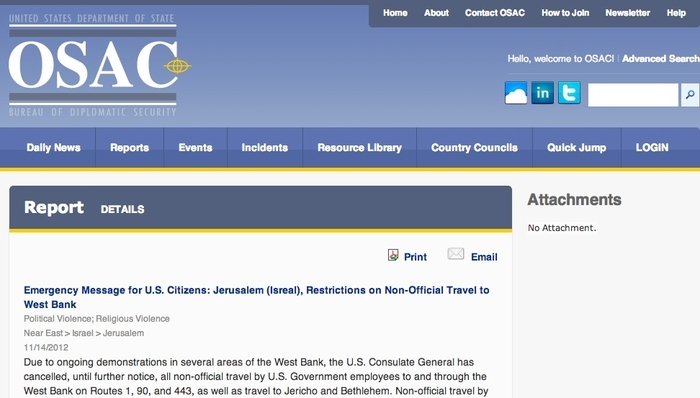 The Department of State steps all over itself on the "Jerusalem, Israel" issue. Mar. 20, 2013 update: That the Obama administration calls the trip of the president, when he spends two nights in Jerusalem, as a "trip to Israel," has come up in a trial in a federal appeals court where a U.S. citizen born in Jerusalem is suing to have his birthplace listed in his passport not as "Jerusalem" but as "Israel." Trump's Recognition of Jerusalem as Israel's Capital – What Does It Mean?